#1 Notre Dame topped #9 Oregon State in the finals of the Vancouver Showcase 91 to 81 to remain a perfect 6 - 0 on the season. The Irish fell behind early as OSU shot over 70% from the field in the first quarter. The Beavers hit 5 of 7 three-point attempts in the quarter. ND trailed after the first ten minutes 29 to 17. The Irish battled back in the second quarter and closed to within four with a little over two minutes remaining until a bizarre sequence in the final minute resulted in a nine-point deficit at the break. Down seven with 40 seconds left in the half, Arike Ogunbowale was fouled driving to the basket. During the stoppage in play, the officials reviewed video of action on the other end of the floor during the preceding OSU possession. Ogunbowale was called for a foul for elbowing an OSU player in the neck. Ogunbowale missed both of her free throws, while the Beavers' Kat Tudor made her two, which resulted in a 50 to 41 score at the break. The Irish kept chipping away at the lead in the third quarter to pull within two at 70 to 68 heading into the final quarter. The Irish outscored Oregon State 23 to 11 in the fourth quarter to take the lead and extend it to the final margin. Jackie Young led the Irish with 23 points, 9 rebounds, 7 assists and no turnovers. She was 8 for 14 from the field and made 3 of 5 three-point shots. She also went 4 for 5 from the line on a night when the Irish only made 17 of 29. However, Brianna Turner, Jessica Shepard and Ogunbowale combined for a perfect 4 for 4 in the final quarter. Turner and Shepard each converted crucial three-point plays in the game's final minutes. Both Turner and Ogunbowale scored 21 points and Shepard chipped in with 17 points and ten rebounds. Turner played her best offensive game since returning from her year-long absence. She shot 9 for 13 from the field, 3 for 4 from the line, grabbed 9 rebounds, and had 2 blocks and 2 steals. Despite the third game in as many nights, Ogunbowale played all 40 minutes, Young 38, Shepard 37 and Turner 36. Marina Mabrey played for the first time this year after sitting out the first five games with a leg injury. 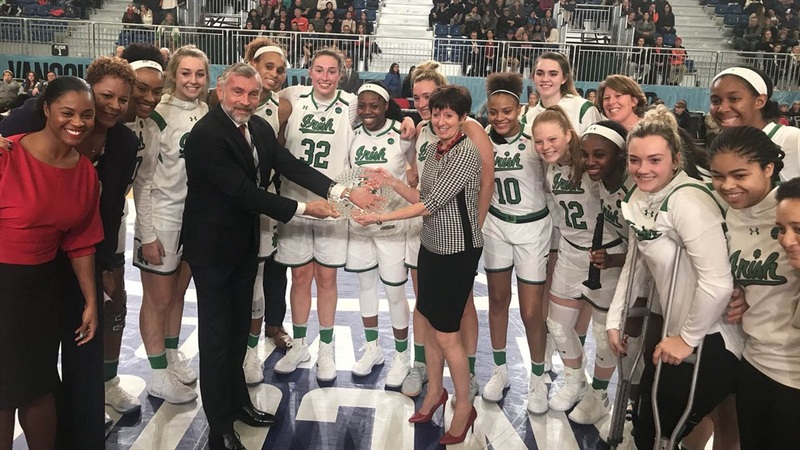 She played 19 minutes, but was in at crunch time and made a long three-point shot to give the Irish a 3 point lead (80-77) which they never relinquished with just over three minutes remaining. Oregon State was led by Destiny Slocum, who scored 22 points. The Maryland transfer is playing her first season for the Beavers after sitting out last season. Mikayla Pivec added 17 and Kat Tudor 16. After a cold shooting start, ND shot 55.9% from the field in the second half, while Oregon State cooled off to 40.7% after the half. After dropping in 5 three-pointers in the first quarter, Oregon State only made 4 of 13 over the rest of the contest. ND scored 56 points in the paint to OSU's 36, scored 14 points off turnovers to OSU's 6, and had 12 second chance points to just 7 for the Beavers. ND protected the ball well, committing just 7 turnovers in the contest. ND won the rebounding battle 39 to 33. After the cold start, Notre Dame won the next three quarters by 3, 7 and 12 points. The Irish outscored Oregon State 74 to 52 over the final three quarters. Both Young and Ogunbowale were named to the all-tournament team, with Arike named the MVP. The Irish return home next Thursday night for the ACC-Big Ten challenge against #12 Iowa followed by the annual match vs. UConn on Sunday.